Y’all, I guess that some stranger decided to go Christmas shopping on me! Well that someone didn’t get too far, they made a couple of gas station purchases and then tried to buy something for $600 at Office Depot and boo-ya, fraud protection kicked in and declined the buggers! I really really wished they’d have gotten busted rather than just declined! Grrrr…That’s the Christmas spirit! Here’s a thought, if ya can’t afford to buy Christmas gifts, why not make ‘em? I feel like sometimes we buy gifts, just to buy gifts, I would rather get a homemade gift than a store bought gift any day! 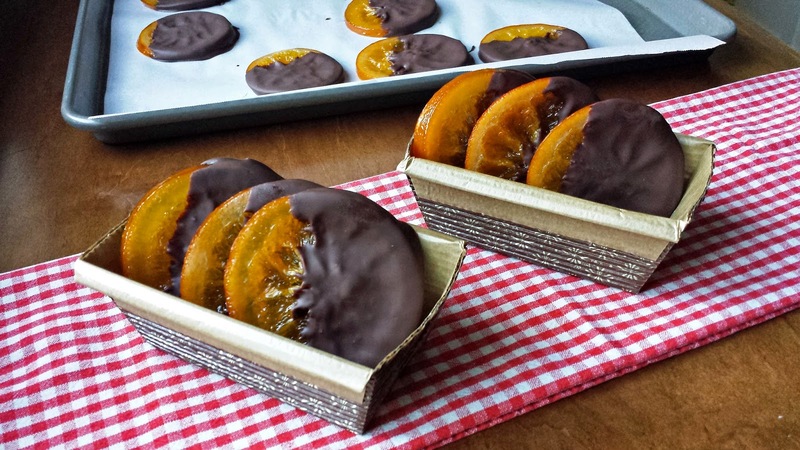 And just look at these Chocolate Covered Candied Oranges! 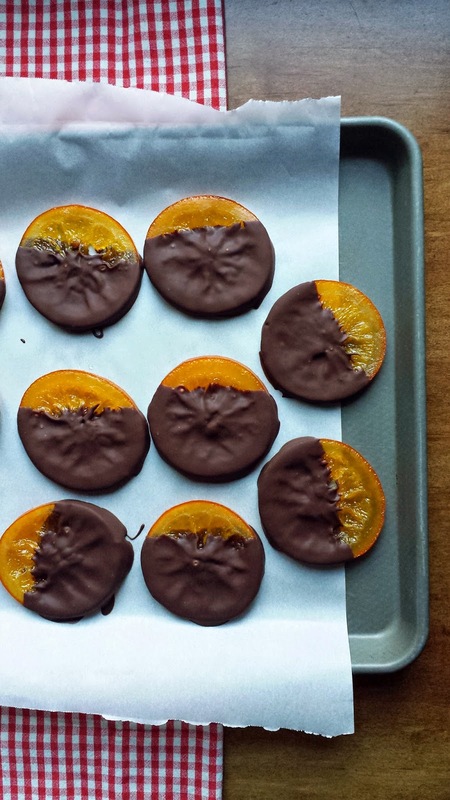 I mean, it’s chocolate, and who doesn’t love chocolate, and the candied oranges look like jewels! This recipe is really easy, but is done steps so that it takes a couple of days to do. Most recipes that you find, only cook the oranges once, which cooks the rind nicely but the pulpy flesh doesn’t get candied enough for me. There are also recipes that candy the oranges for 2 weeks, and while I’m sure that those are totally awesome…who plans that far in advance…asks the procrastinator extraordinaire? The oranges are cooked first in a more diluted sugar syrup, for just over an hour and then allowed to dry overnight…And this is where most recipes end. I take it one step further and cook the oranges a second time in syrup with a higher sugar content, and then left to dry overnight again. And now the pulp is more translucent and looks like a pretty orange jelly candy. You could just toss those oranges in super fine sugar, and they be pretty and frosty looking. So you don’t have to rob a bank or steal my credit card info to give great gifts! A homemade gift is a gift from the heart that your friends and family are sure to love! 1. Add the water and sugar to a 6 quart sauce pan, bring to a boil over medium-high heat. 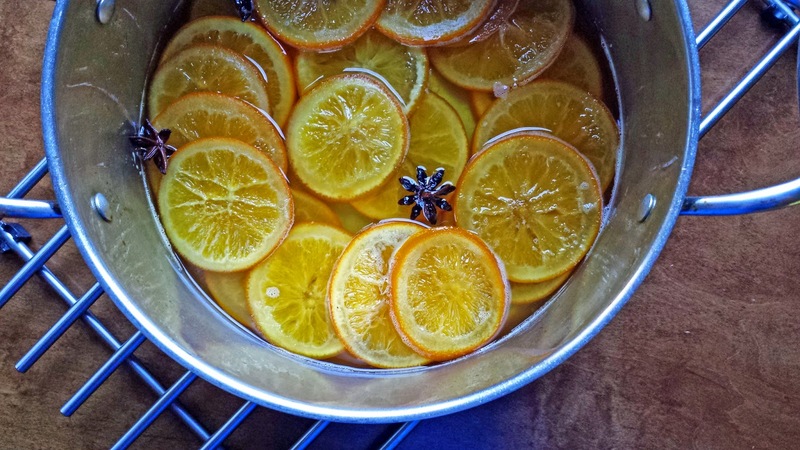 Once the sugar has completely dissolved add the star anise pods and the orange slices to the liquid. Stir them gently with a wooden spoon. When the liquid returns to the boil, reduce the heat to medium, simmer for 1 hour and 15 minutes, use the back of the wooden spoon to gently press the oranges down into the liquid every once in a while, but don’t stir. 2. 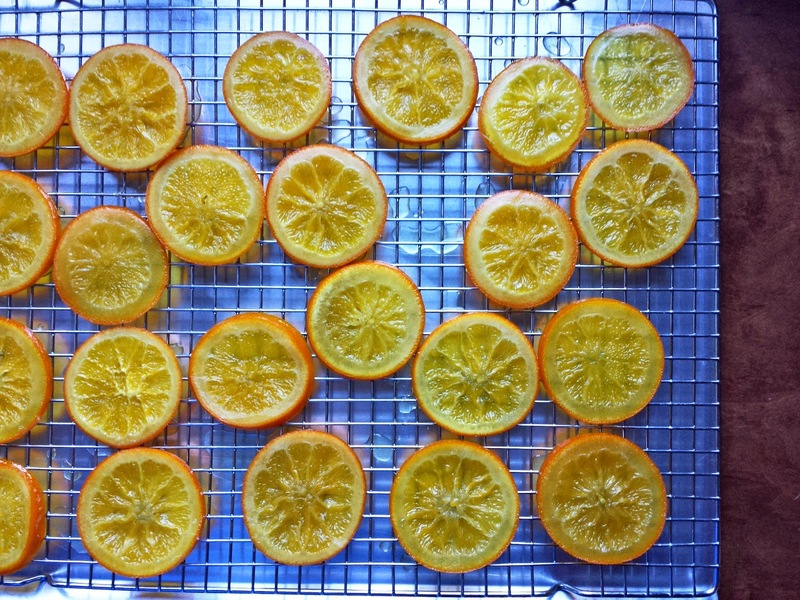 Use a slotted spatula to remove the orange slices to a wire rack which has been situated over a sheet pan. Place somewhere where it will be undisturbed overnight. Do not cover. 1. Add the sugar and water to a large skillet and bring to a boil over medium-high heat. Gently place half of the orange slices in the liquid. When the liquid returns to the boil, reduce the heat to medium and cook the oranges for 15 minutes. Return to the wire rack, using a slotted spatula. 2. Add another ½ cup of water to the liquid and bring it back up to the boil, repeat the cooking process with the remaining orange slices. 3. Again, allow these to be uncovered and undisturbed overnight. 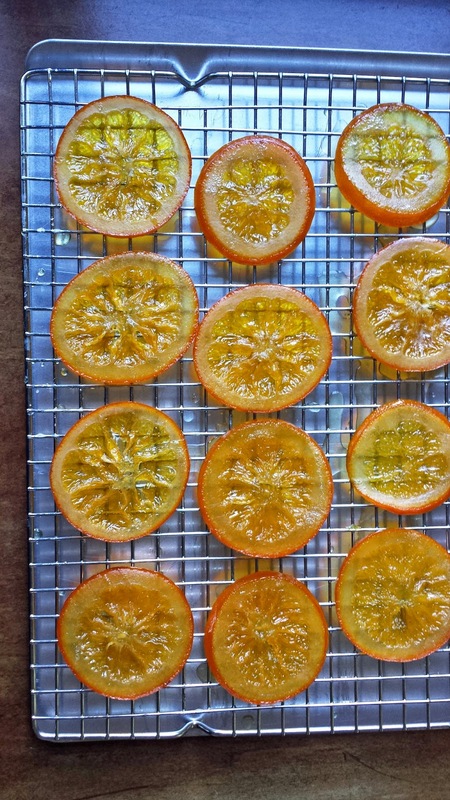 Notes: *If you don’t want to cover these in chocolate, you may gently toss the candied orange slices in super fine granulated sugar before allowing them to dry overnight. They will be pretty and look frosty. **The syrup from step 1 and step 2 is really flavorful; so you may want to strain the syrup and keep it for pouring over a polenta cake, Gingerbread Cake; or you can even make caramel sauce (see below) or caramels with it. 1. Line 2 sheet pans with parchment paper. Place to the side. 2. Cut the chocolate with a serrated knife into small bits. Place about 2/3 of the chocolate in the top of a double boiler which has been place over gently simmering water and stir until melted and smooth. (If you prefer the microwave, place the chocolate in a microwave safe bowl, and cook in 30 seconds bursts stirring each time until the chocolate is melted and smooth.) Remove the chocolate from the heat, and add the remaining 1/3 of the chocolate, stir until smooth. This method tempers the chocolate so that it has good texture and won't bloom (when chocolate gets that white film it's called bloom). 3. 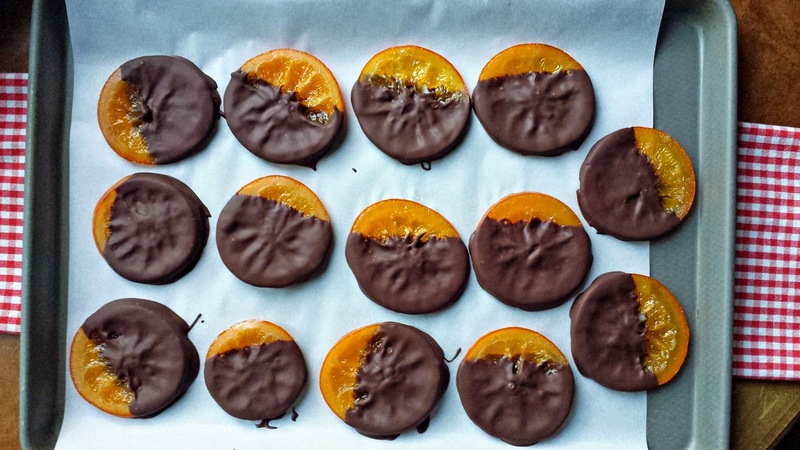 Dip the oranges into the chocolate, gently (barely) dragging the back of the orange over the lip of the pan to remove some of the excess chocolate, and then place on the lined sheet pan. When the oranges are covered, place them into the refrigerator for about 20 minutes to allow the chocolate to set. Now they are ready to package, cupcake liners are great this. It’s best to leave them in the refrigerator or a cool dry place. 1. Pour the leftover syrup from steps 1 and 2 into a large skillet. Bring to a boil over medium-high heat, and reduce the syrup, stirring with a wooden spoon until the color is a deep caramel color (this takes about 15 minutes or so). Stir in about a cup of heavy cream, and remove from the heat. Use immediately, or store in the refrigerator. Caramel sauce may be eaten cool, or can be re-heated.